The Greystone Press published a few advertisements in 1936 and began publishing books in 1937. The firm published a mishmash of fiction, political books, biography and other miscellanies. Greystone was in bankruptcy by the early 1940s. In 1942 Greystone was acquired by Harold Mossler and his brother-in-law John Alun Stevenson. Stevenson continued managing the firm, as part of the Greystone Corporation, until the early 1990s. Stevenson was the son of William Henry Stevenson, editor of the London Daily Herald. The younger Mr. Stevenson worked in the circulation department at the newspaper where an important promotional effort consisted of offering coupons in the paper to purchase cheap books (sold by the newspaper for not much over their actual cost). Stevenson (after his work in Australia) ended up at the New York Post, where he developed a coupon-based promotion for the complete works of Dickens. Stevenson left the Post and established the Newspaper Circulation Promotion Co. in the late 1930s, which was contracted by dozens of newspapers to offer coupon-based book and records. Stevenson began working for the Doubleday Book Club in 1942, the same year he changed the name of the Newspaper Circulation Promotion Co. to Book Presentations and, along with his brother-in-law Harold Mossler, acquired the bankrupt Greystone Press. Stevenson and Mossler were not interested in the Greystone backlist, but instead on its stockpiled paper stock, scarce due to war rationing. Book Presentations published how-to books, including popular books on sewing, during WW2. 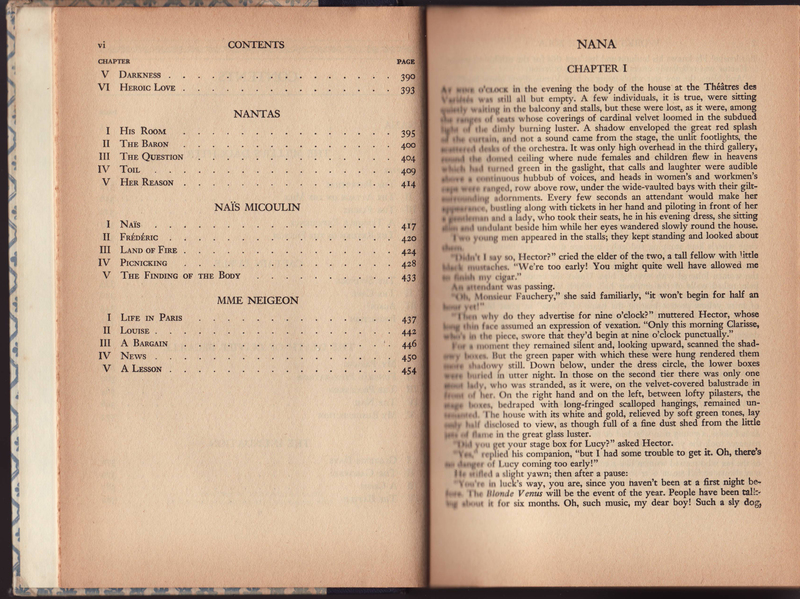 In 1946, after the war, the Fiction Book Club started publishing romance novels, and, under the Greystone Press imprint, more DIY titles, including gardening, home-improvement, weight loss, and, under the Masterworks Library series name, a collection of literary classics. Many of these books were sold via advertisements in newspapers and other periodicals with a diverse array of promotional gimmicks, contests, and radio advertising. In 1948 Stevenson along with former Doubleday book club head Milo Sutliff joined together to expand the Greystone Press efforts to include record clubs, along with more book clubs, including those focused on business and religion. These efforts were combined under the name of Greystone Corporation, which Stevenson was involved with until the 1990s. Fred Breismeister, who was involved with slightly shady mail-order encyclopedia and classics series sales from the late 1930s onward (including the Spencer Library) joined forces with Stevenson and the Greystone Corporation in the marketing of books and other media in the 1960s. Much of this history is taken from the chapter “The Engine of Capitalism” in David Bonner’s Revolutionizing Children’s Records: The Young People’s Records and Children’s Records (Scarecrow Press, 2008). The Masterworks Library was a generic series of classics of interest mostly as a prime example of the post-WW2 mail-order reprint book series. The same people buying books about how to buy your first home, or fix stuff around the house, or lose weight, were interested in a foot or two of classics which they probably never read, but instead displayed in their home. 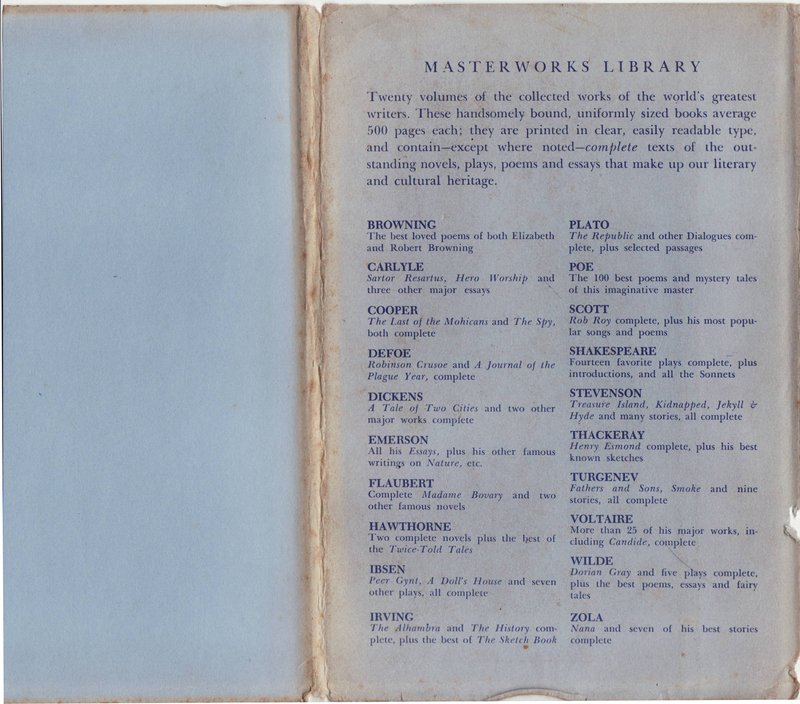 Thus the Masterworks Library played a role in the performance of a post-WW2 suburban family which included the need to express some cultural sophistication with household items such as classic books. 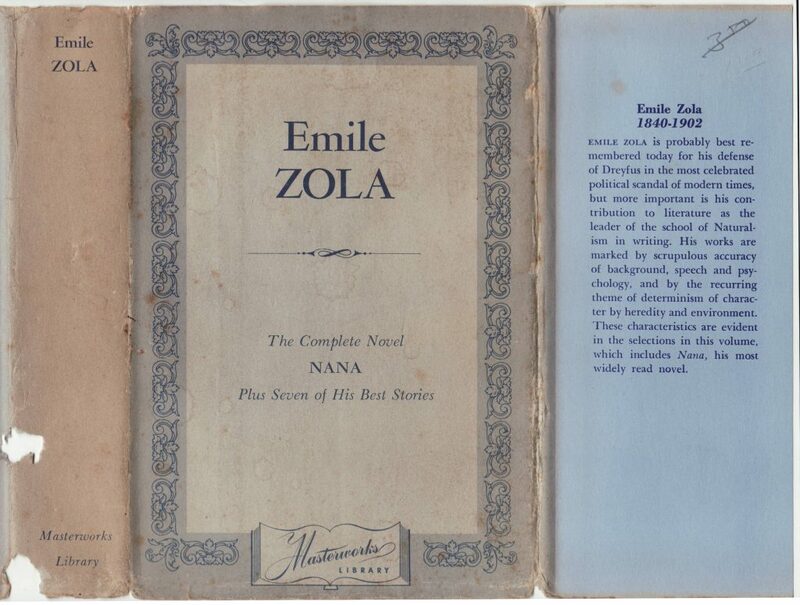 The book below, Emile by Zola, is undated but published sometime in the late 1940s or early 1950s. The jackets for the series are common to the series and unremarkable in their design and quality. Neither the jackets nor books varied in design over the decade or so the books were sold. The series name, but not the publisher, is indicated on the jacket spine. The front of the jacket is framed with a fussy border with a brief description of the content under the author and title. The front jacket flap contains a brief biography of the author. A colophon for the series is included at the bottom front of the jacket. 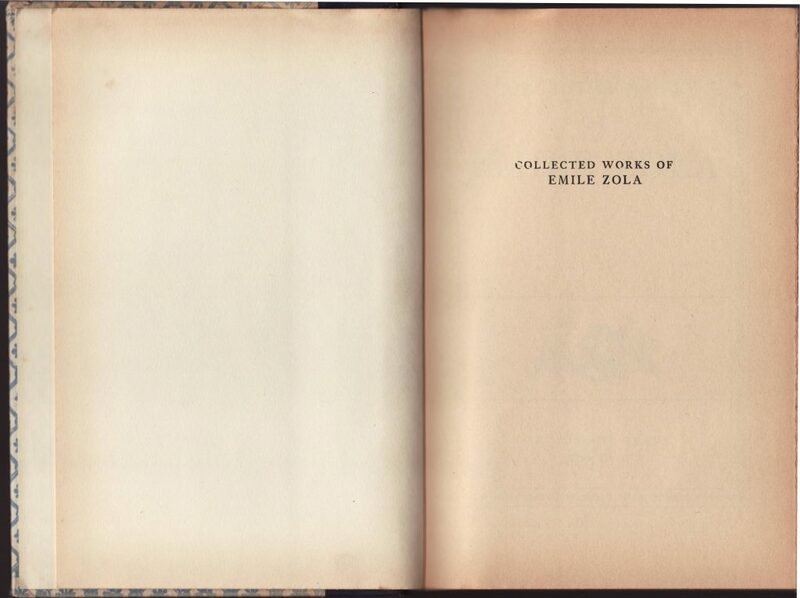 The books are quarter bound with a plasticized material for the spine, which included gold typography and designs of what would have been considered stately design, quite visually appropriate when lined up on the shelf in your Cape Cod house in some forgettable suburb. “Library Edition” graces the bottom of the book’s spine – apparently this was seen as more classy than the actual publisher name or series name. 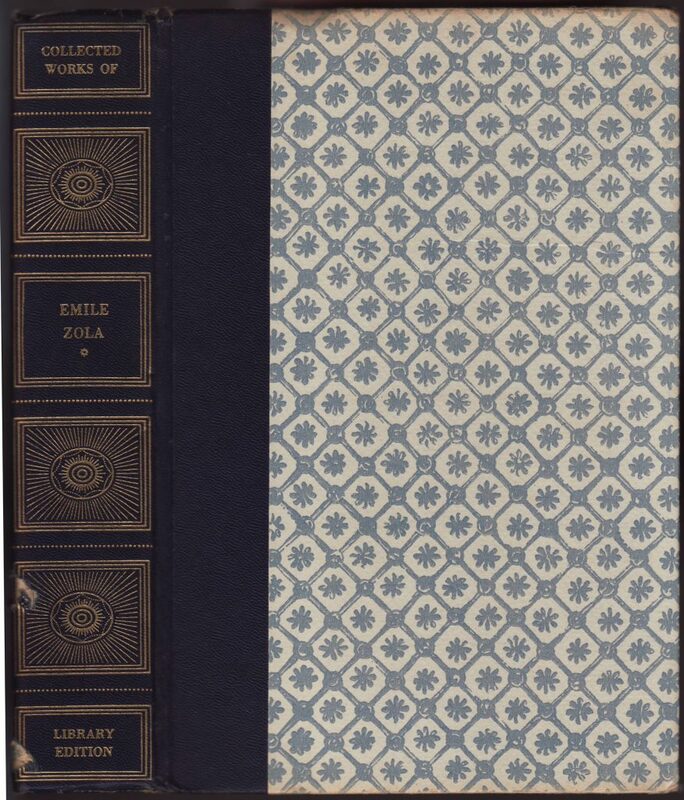 The paper book covers consist of a repeating pattern design, common to various book series from this era, and probably inspired by the Curwen Press book designs of the 1930s. The half-title page. Note the yellowing paper. These were cheap books. 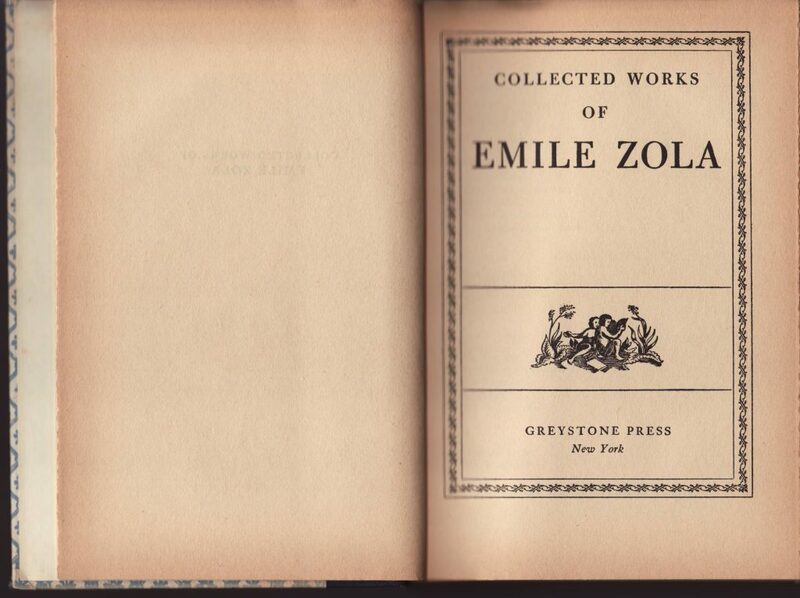 The title page and Greystone imprint. The books were printed in the U.S. by George McKibbon & Son in Brooklyn, NY. 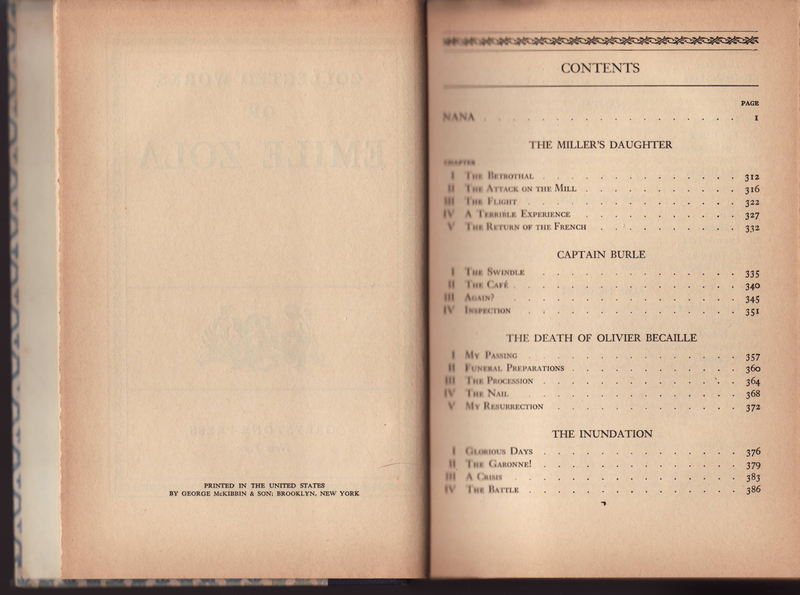 The rest of the table of contents and first text page.